This evening I had a Skype chat with Anna Birney, who is the head of System Innovation Lab at Forum for the Future, to meet and to exchange views and ideas about the topic. I learned a little bit more about the new strategy FFF has just launched and explained Anna what I’ve been doing in relation to system innovation in the past five years. Both Anna and I share the opinion that the theories around system innovation and transitions, although useful to understand how systemic change occurs in socio-technical systems, has so far been a little bit slack in providing pointers and leverage points to transform systems at practical level. I also must add to this that, the discourse has been predominantly techno-centred and not much emphasis has been put on social innovations in system innovation experiments. This is, in my opinion, mainly due to the fact that the theories have been coming out of the European Union context which is primarily post-industrial, advanced in technological innovation and dominated by a Western worldview of well-being. I know through some of my contacts in academia that research in system innovation area is now starting to investigate emerging and bottom-of-the-pyramid economies (for example the program led by Rob Raven) and validity of models and theories in different socio-cultural contexts. I have been mulling over some questions about system innovation especially in the context of companies and innovation teams for a long time now. I’ll list them here. But first I’ll introduce the multi-level perspective on system innovations which has been developed over the years mainly by Rene Kemp and Frank Geels who are well-known scholars in this area (see Kemp, 1994; Geels, 2005a, 2005b; Geels and Schot, 2007). In order to investigate innovation at system level, not only technological change but also changes in user practices, markets, regulations, culture and infrastructure, which altogether constitute the socio-technical regime, should be addressed. This model portrays the dynamic nature of system innovation through a layered structure. According to this model, the stability increases and rate of change decreases towards upper levels of the socio-technical system, but the depth and influence of change increases towards lower levels. Nevertheless the change does not happen in a linear fashion and the relationship between the three levels is similar to a nested hierarchy. The layers have internal dynamics as well as influencing changes at other levels and the central focus is at the middle where the socio-technical regime resides. Geels (2005a, p.83) explains “First, novelties emerge in technological and/or market niches. Niches are crucial for system innovation, since they provide the seeds of change. The emergence of niches is strongly influenced by existing regimes and landscape, … [T]he influence from the regimes on niches is stronger and more direct than the influences from landscapes, which is more diffuse and indirect” . The niches are loosely structured and there is much less co-ordination among actors. The regimes are more structured than niches and the rules of the regimes have co-ordinating effects on actors through a strong guidance of the activities of the actors. Landscapes are even more structured than regimes and are more difficult to change. Nevertheless, as the figure suggests, landscapes influence change both on niches and regimes; in return, niches (may) change the regimes, and the new regime changes the landscape in the longer term. The socio-technical landscape in this model is relatively static, stands for the external context and represents the physical, technical and material setting supporting the society, and cannot be changed by the actors in the short-term. Landscapes are constituted by rapid external shocks, long-term changes and factors that do not change or change only very slowly. In order to manage systemic transitions, the lowest level of MLP model, i.e. the niches, play an important role since radical innovation takes place in niches whereas in socio-technical regimes innovation is incremental. The niches consist of promising innovations and they have to be protected in order to enable them to develop from an idea or a prototype to a technology which is actually used. 3. Niche innovations are counter to and threatening for the incumbent regimes and their business/market logic. In this case, how best to protect them and manage their maturation while avoiding the sudden collapse of the incumbent regimes? Who is going to carry out this mediatory management job? If everything will be left to the self-organising dynamics within the system, how will maturation of these niches be guaranteed? If there’s no guarantee possible, what’s our Plan B? 4. And finally, it has been observed that while these niches are maturing, there have been value changes in their associated entrepreneurial contexts to become aligned with the values of the socio-technical regime that is aimed to be changed. How can the individuals -the entrepreneurs- be empowered so that the value compromises they have to make to place their innovations in the market and compete with established companies and technologies do not exceed levels to nullify their change agency? Geels, F. W. (2005a). 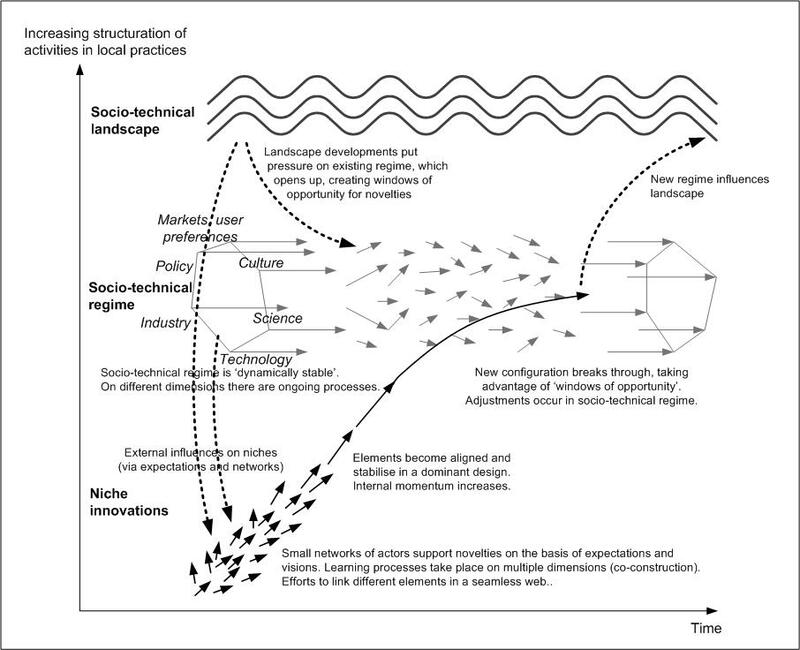 Technological transitions and system innovations: a co-evolutionary and socio-technical analysis. Cheltenham, UK ; Northampton, Mass. : Edward Elgar Pub. Geels, F. W. (2005b). Processes and patterns in transitions and system innovations: Refining the co-evolutionary multi-level perspective. Technological Forecasting and Social Change, 72(6 SPEC. ISS. ), 681-696. Kemp, R. (1994). Technology and the transition to environmental sustainability: the problem of technological regime shifts. Futures, 26(10), 1023-1046.
the MLP and its associated research has been a core reference point for our work on System Innovation at Forum. Your questions are a long similar lines – both personally and as part of the Lab – for example the relationship between sustainablity and landscape level changes. If we see sustainabiltiy as a shift in worldview to one which looks beyond the current industrial growth society then what implications does this have for the model? What is the relationship between the niche and the landscape? If with sustainability we are pushing a new value set how does this shift the regime rather than just be consumed by the current regieme? Within our work we are also investigating the role of incumbants in creating new business models which mean they evolve and become the new.. think Nokia transforming their business. How can business transform their business model so as to create the niche and shift the landscape? Is this at all possible? From a systemic perspective how do we collapse the model and think about actors as part of a social web or relationships.. .how do we think of this as a process of co-evolotion? So as we go forward with our work at Forum lets see what we learn about the nature of transition through a practical exploration of the issues, through working in these relationships and pushing and challenging and creating the new…. I look forward to continuing the conversation! Dear “emerging researcher” in the area of system innovation for sustainability – I just stumbled upon your blog, and am currently in the final month of finishing my thesis on.. sustainable innovation, based on the MLP, whilst combining it with developing scenarios for design. Funny how minds are alike across the ocean, since I’m located in The Netherlands. Would like to continue my (currently very internal) thesis-conversation with others in the field when I’m finished – you can find my contact details through Twitter (@bputmancramer) or through my blog http://www.livingantenna.com. Look forward to hearing from you! Hi Barbaba, thank you for your comment and following my blog. Your message prompted me that I should write something about myself, starting with me name. 🙂 This is a blog which I started with such enthusiasm but unfortunately I couldn’t have much time to develop it. I’m hoping to write more soon. I wish you all the best with your thesis. The Netherlands is the best place to do system innovation research as it emerged from there and there are really great researchers in the area there. Nice meeting you albeit in the virtual world.